Researchers from Trinity College Dublin have shown that the wings of insects are not as fragile as they might look. A study just published in the scientific journal PLOS ONE now shows that the characteristic network of veins found in the wings of grasshoppers helps to capture cracks, similar to watertight compartments in a ship. "The desert locusts are the marathon-flyers of the insect world," says Dr Jan-Henning Dirks, who studied the properties of the wings together with Professor David Taylor at the Department of Mechanical and Manufacturing Engineering. "These grasshoppers can fly for days across deserts and oceans with wings ten times thinner than a human hair". During these long journeys the wings of the grasshoppers have to withstand hundreds of thousands of wing beats without failure. What is their secret? Like all insect body parts, the wings are made from cuticle, which is the second most common natural material in the world. "We were quite surprised when our first experiments showed that the membrane of the wings alone was not very tough." said Dirks. "We were expecting the membrane to be at least as tough as the legs." However, when Dirks and Taylor then looked at the videos they recorded, they found that most cracks were effectively stopped once they ran into a cross vein. These minute crack barriers increased the wing's toughness by 50%. So if these veins are so good in stopping cracks, why not have more of them? "Compared to the thin wing membrane, the wing veins are relatively heavy. Therefore you want as few veins as possible to keep the weight of the wing low," said Dirks. 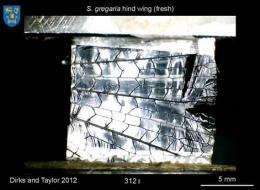 However, as the videos demonstrate, with fewer veins in the wing there's less protection against cracks. "It's like the watertight compartments in a ship. With too many compartments, the ship gets too heavy. With too few, a single hole can sink the entire ship." To answer the question What is the optimum ratio of the membrane and the veins? The researchers studied the characteristic pattern of the wings in detail and measured the size and shape of the almost 1000 vein "cells" found in each wing. Using fracture mechanics, Dirks and Taylor then showed that the spacing of most wing veins matches the membrane's so called "critical crack length". At a given stress, cracks smaller than this material constant do not grow. "Thanks to this precise spacing of the cross veins, the cracks are always stopped before they can reach this critical length and start growing themselves. " says Taylor "Nature has found a mechanically 'optimal' solution for the locust wings, with a high toughness and a low weight." The researchers believe that the vein pattern found in insect wings thus might inspire the design of more durable and lightweight artificial 'venous' wings for micro-air-vehicles. And by "reversing" their analysis, one could possibly even use the vein spacing of fossil insects to study the wing properties of extinct insect species. I guess we can expect to see new designs for hang gliders, based on this discovery. I wonder if it could be applied to composite material wings and structural components...? I guess we can expect to see new designs for hang gliders, based on this discovery. Probably not. Hangglider material is already strong enough and not prone to tears. Adding rinforced 'veins' would just add unneeded weight. This principle has been known for a long time. It's used in parachute nylon, called rip-stop. Every tenth thread or so horizontally and vertically is a thicker grade. And probably already in hang gliders and anything else that needs rip proof cloth. I've seen it in shorts too. It's easily identifiable by a square pattern in the nylon. I am amazed how great and prefect the nature are put together, and there are so many things we can learn from the nature! For "nature" to have found a "solution" there must have been a very precise specification of the problem. It begs the question just how "nature" could have arrived at such a specification via random physical/biological processes. Nature does not have an inbuild ability to reason about purpose, function and design so where did the specification come from? We see this kind of thing everyday everywhere - "nature has developed a solution to an almost intractable problem". Where did "nature" get the ability to reason? Do your job, moderators. You've let kevin get away with his religious trolling since the day he registered. For "nature" to have found a "solution" there must have been a very precise specification of the problem. The specification was: "your mutation has wings that break - so you die. His mutation has wings that don't break - so he gets to breed and pass on that gene"
You can't get a much better specification than that, can you? You are absolutely right. Nature has no foresight. But trial-and-error IS a method by which you arrive at a solution - even if you aren't aware of a problem. This is why a designer is not possible: A designer has foresight. A designer has a plan. A PERFECT designer would NOT choose a design for a species that will cause it to die out - but more than 90 percent of all species recorded have died out. So either we have the most inept designer conceivable (which would beg the question who would make such a designer) or we have no designer. You can only believe in intelligent design if you know absolutely NOTHING about design.